We’ve said it before, and we’ll say it again. 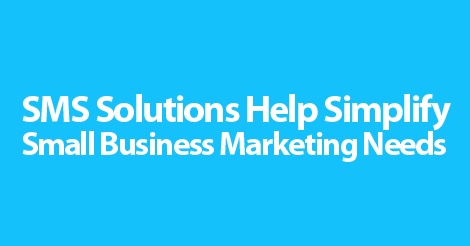 Small business marketing is no easy task. In fact, you can spend months, even years, trying to conquer this task, If you’re lucky, you’ll eventually find permanent, affordable solutions. From social media to word of mouth marketing, let us remind you: there are options. In fact, sometimes you might be faced with too many options. Out of the hundreds of available marketing tactics, it’s important to find a select few that really perform for you. Now, let’s bring text marketing into this conversation. What makes this solution so appealing to small business owners? Well, let’s start off with the obvious: it’s insanely affordable. On top of that, it boasts an almost immediate return, if implemented correctly. Next to all the obvious monetary benefits, text marketing takes advantage of current mobile trends. It allows you, the business owner, to connect with the next generation. Did you know that 99% of all text messages are opened and read within the first five minutes? That’s an undeniable statistic. Imagine if your email campaigns boasted that same return? Or, even better, imagine if people listened to 99% of the words that came out of your mouth? Honestly. the world would be a better place. But for now, we’ll pause the dream talk, and get back to the basics. Text marketing helps small business owners conquer their marketing goals, with just the reach alone. Have something important to say? Fire out a mass text message to subscribers in a matter of seconds. Who can argue with that simplicity and efficiency? Partner up with the top small business text marketing service. Give us a call at 1.800.688.6290 to learn more. If you’re ready to get started, hop over to the pricing page and sign up for a free plan. Our feature rich platform empowers you, the small business owner to succeed.